Juniper Green’s FairWild Junipers are certified Organic and are gathered from a forest in Bulgaria. FairWild certification means those harvesting are properly paid for their Junipers, which are harvested in a sustainable manner. Juniper Green’s FairWild Junipers are certified Organic and are gathered from a forest in Bulgaria. FairWild certification means those harvesting are properly paid for their Junipers, which are harvested in a sustainable manner. Juniper Green is the only Gin in the world with this amazing new certification for wild harvested ingredients. The first crucial spirit distillation occurs on their estate where all their grain is grown, which has been organic for 35 years, making the spirit they use truly Single Estate. The super smoothness of Juniper Green owes all to this unique heritage. This dedicated care and attention has created one of the world’s great gins. 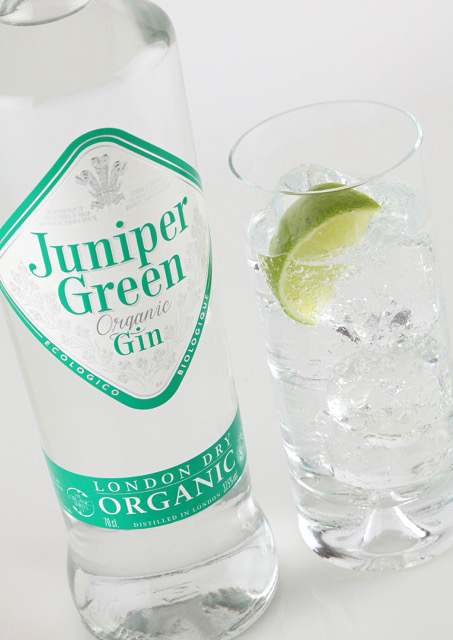 Since it was first introduced in 1999 Juniper Green has won a total of 20 international medals against all the world’s gins, including golds in the UK and USA. For more information, please visit www.junipergreen.org. To be in with a chance of winning, simply sign up to our newsletter using the form above. By entering your details, you will automatically be added to the Vegan Food & Living email newsletter mailing lists, keeping you informed of news, special offers and promotions via email. Anthem Publishing will not pass on customer email addresses to other companies. You may unsubscribe from these messages at any time. The editor’s decision is final. The competition is open to UK residents only. Closing date: 19 December 2016.